It looks like a deal with something for everyone. The UK gets significant equity funding for the first reactor in a massive 19 Gwe nuclear build in return for letting Chinese firms book an export sale of its newest light water reactor (LWR) technology in a western nation with the ability to pay for it. Earlier this year China booked a sale for a Hualong One with Argentina, but for now, unless a miracle occurs, China will be building and providing 100% of the financing for that plant as a turnkey project with Argentina paying it off with revenues generated by the electricity produced by the reactor. What set the complex deal in motion is that EDF, which is planning to build two Areva 1600 MW at the Hinkley site, simultaneously issued two press releases both filled to the brim with bad news. First, EDF said that its planned completion of a similar EPR nuclear plant at Flamanville in France is falling further behind in its schedule and it was cost more, a lot more. The cost of the project is now pegged at $11.7 billion. Anyone looking at the players involved in Flamanville, and has a stake in Hinkley C, is now wondering about the ability of Areva and EDF to complete that project on time and within budget. EDF and Areva are also pegged to build two more EPRs at the UK’s Sizewell site. From the perspective of UK PM Cameron, these players have a lot of risk associated with them and on his watch. Second, EDF said it was halting further work on the Hinkley C site until the finances for the project could be settled in terms of funding for it. This produced all kinds of uproar in the UK tabloid press which said that EDF was calling it quits. EDF strongly countered that it has complete confidence in the project. According to the UK newspaper The Express, PM Cameron blew a fuse over the latest delay which put in motion the swap of funding for Hinkley C now in return for buying a Hualong One later. According to the newspaper, EDF would sell its development rights at the Bradwell site to the Chinese firms. The UK government and EDF would help the Chinese firms negotiate the complex regulatory review process of reviewing the design of the Hualong One. Approval from the UK Office of Nuclear Regulation is needed as part of its Generic Design Review for new reactors. It is an expensive and time consuming process. The nuclear energy deal will likely be discussed, and perhaps agreed to in principle, during a state visit to the UK next month by Chinese President Xi Jinping. The issues associated with funding Hinkley C have only increased over time. The plant was originally planned to open in 2017, but now EDF says the earliest it would enter revenue service is 2024. UK PM Cameron is reportedly manifestly unhappy with this delay and has his civil servants burning the midnight oil to hammer out the details of an agreement with the two Chinese nuclear firms that would be involved in the deal – China General Nuclear and China National Nuclear Corp. 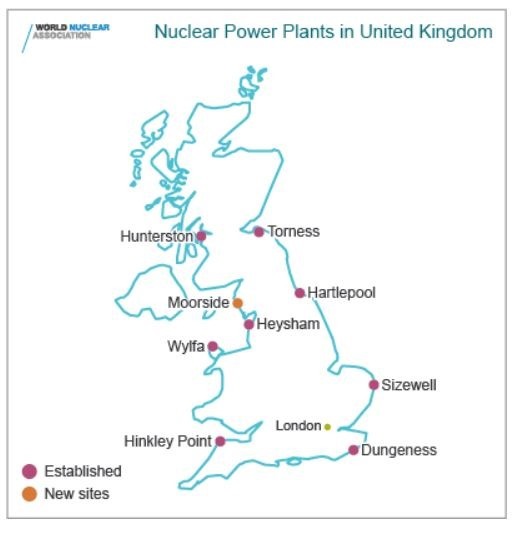 According to wire service reports, the two firms would be minority stakeholders in the Hinkley C plant and also get options to be equity partners in the subsequent EDF led Sizewell project. 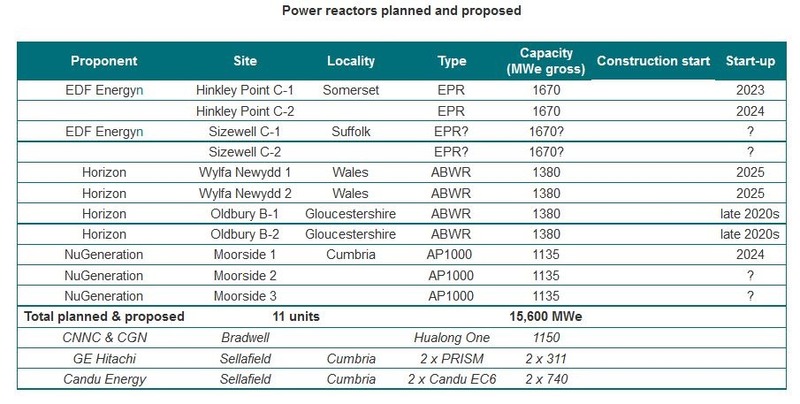 Table of planned new nuclear reactors in the UK. Data and table courtesy of World Nuclear Association. The problems with the estimated costs of the reactors has re-energized calls for the UK to nationalize its new reactor building program to reduce costs by eliminating the interest costs of capital. The UK must build out its program of new reactors due to the end of life of the current fleet and being more or less over a barrel energy wise due to the diminished oil and natural gas coming from the North Sea. The UK government has said that there is a real prospect of power cuts, brownouts, and other troubles with electricity reliability if the reactors are not built. Find out how China is currently doing with the two EPR’s that IT is building at Taishan. That is very important here. By the time they start in the UK at least the Chinese may have shown they can build these things.